My dad loves Asian food and over time, most of us have to come to share that love. It's one of my favorite comfort foods and I really like that it makes the perfect relaxed evening or can be dressed up for a nicer dinner. While I thoroughly enjoy take-out, it's also a lot of fun to make Asian dishes at home! Perhaps one of my first favorite dishes (beside Sweet & Sour Chicken) is Mongolian Beef. Today, I'm sharing a recipe that I adapted and we enjoyed. Just make sure to choose a tender cut of beef and thinly slice it. Make the sauce by heating 2 tsp of vegetable oil in a medium saucepan over med/low heat. Don't get the oil too hot. Add ginger and garlic to the pan; add the soy sauce and water before the garlic scorches. Dissolve the brown sugar in the sauce, then raise the heat to about medium and boil the sauce for 2-3 minutes or until the sauce thickens. Remove it from the heat. Slice the steak against the grain into 1/4" thick slices. Dip the steak pieces into the cornstarch. Let the beef sit for about 10 minutes so that the cornstarch sticks. As the beef sits, heat up about one cup of oil in a wok. Heat the oil over medium heat until it's nice and hot, but not smoking. Add the beef to the oil and sauté for just two minutes, or until the beef just begins to darken on the edges. After a couple minutes, use a large slotted spoon to take the meat out and onto paper towels, then add the broccoli and saute until tender crisp (about 3 min.). 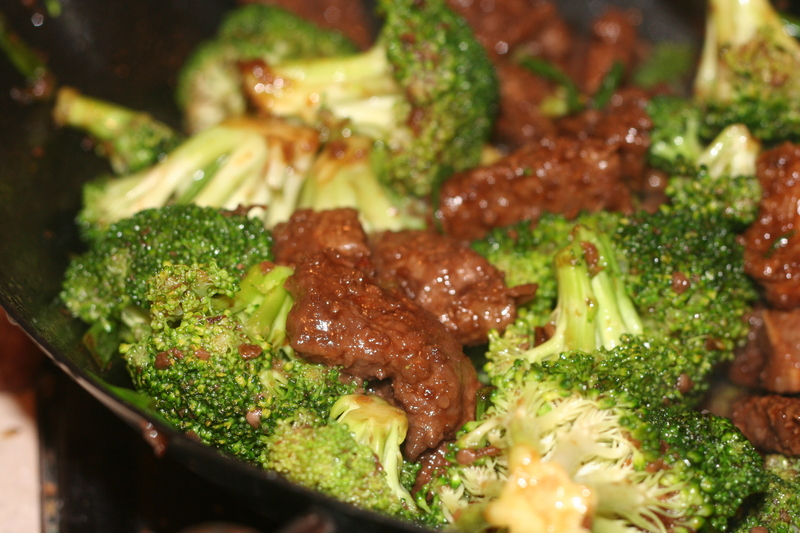 Remove broccoli and pour out excess oil. The add the meat and broccoli back into the wok and simmer for about one minute. Add the sauce, cook for one minute while stirring, then add all the green onions. Cook for one more minute. Serve over rice.